I didn't get a chance to post these sailboat snack cups that I made last month for a church event and later, a play date. They were inspired by this Paper Source nautical sailboat kit. I tried to make sure that each step was photographed and visually represented, but feel free to leave a comment if there are any questions. These cups can spruce up the nosh table at your next play date, or they can serve as favors and/or place cards at your next birthday party. Just add a tiny flag at the top of the mast where you can write each child's name--I used the adhesive part of super sticky post-it notes to make it a snap. Different sources served as inspiration for the colors of Nate's party: a post from Scouts Honor Co., Dwell Studio's beautiful color stories and some napkins we found at IKEA. (Sometimes inspiration comes in little packages.) The pennants were crafted using blue and white twine and Paper Source paper. The paper used to wrap the gifts was also from Paper Source. I wanted the party to reflect Nate's world as a two-year-old: his toys, playthings and favorite treats. Nate's name was spelled out using Land of Nod's whimsical Nod Blocks. The party nosh included animal cookies, chocolate-covered Cheerios and chocolate-dipped Speculoos cookies. Nate's Kid O Stack and Nest cups held some of his favorite snacks. There were also miniature vanilla cupcakes with lemon frosting (delivered in Nate's Kid O Tip Truck) and a whoopie pie from Susiecakes. The favors were vending machine capsules from Shop Sweet Lulu and contained little things for Nate to shake, explore and examine: bits of ribbon, big buttons, finger puppets, wooden toys and a rubber duck, to name a few. The huge "2" balloon was from a local Party City. 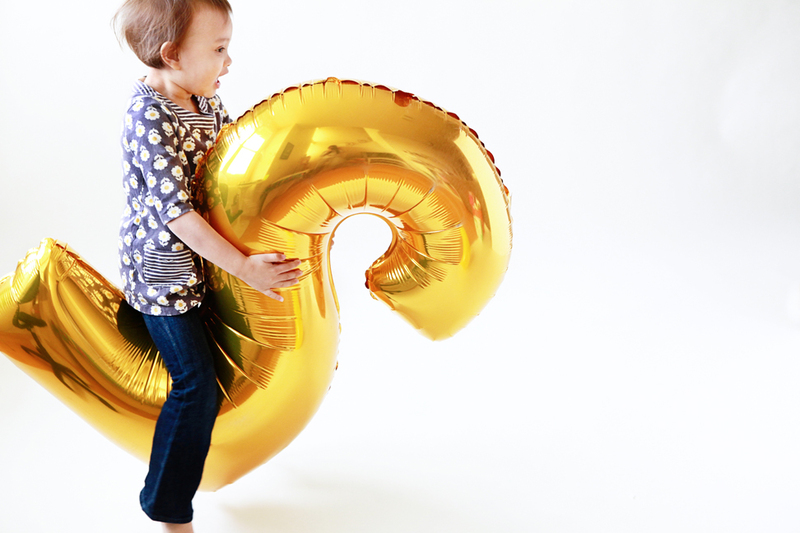 Later, Avery galloped around on the balloon like a horse, which was a riot! It was a fun afternoon of opening gifts, nibbling on snacks, studying and shaking the different capsule favors, bobbing the huge balloon up and down and general merrymaking. Happy birthday, Nate! We thank God for the joy and blessing you are.